Racin’ Today » Stewart Following The Path Of Earnhardt Sr.
Stewart Following The Path Of Earnhardt Sr.
Daytona Beach, Fla. – Shades of the late, great Dale Earnhardt. 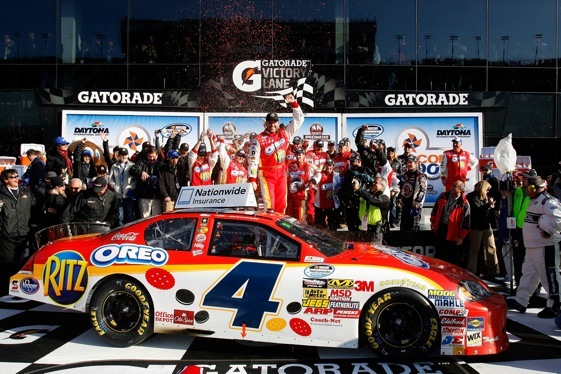 Tony Stewart knows how to win everything at Daytona International Speedway except the big one – the Daytona 500. Smoke did it again Saturday, holding off fellow Sprint Cup stars Carl Edwards and Kevin Harvick, along with Nationwide Series regular Justin Allgaier to win the opener of the second-tier NASCAR series for the third time in a row and the fifth time in the last six years. It was also Stewart’s 15th victory at Daytona, including three in the July Cup race, two in the 150-mile qualifying races for the 500, three in the Budweiser Shootout and two in the all-star IROC series. That ties him for third on the all-time Daytona victory list with Cale Yarborough, trailing only Bobby Allison with 16 and Earnhardt, who won an amazing 34 times here. “When you put it that way, that just makes it even more a little special,’’ Stewart said when the numbers were revealed in the media center during his post-race interview. Now, all the two-time Cup champion has to do to gain some real satisfaction is win the big show, the 500, a race that Earnhardt didn’t win until his 20th try. Stewart, like Earnhardt, has come close, finishing second in 2004 and third in 2008. But he’s 0 for 11 heading into Sunday’s race. He’ll get another chance in less than 24 hours. Looking ahead to Sunday, Stewart said, “I’ll be honest, I really don’t know what to expect. I mean, I assume it’s going to be something similar to the qualifying races. But, you know, with having the full field, obviously you’re gonna have a lot more good quality cars that are right. If Saturday’s Driver4COPD 300 is any indication, the Sprint Cup opener could be a wild one. There were seven cautions for a total of 32 laps and three big multi-car crashes that took out several of the big names, including teammates Dale Earnhardt Jr. and Danica Patrick, making her NASCAR debut in a JR Motorsports Chevrolet. Patrick was the focal point of the race for many, certainly the biggest name of the day for ESPN. The IndyCar star barely avoided one of the big crashes early in the race, but got caught up in a 10-car crash on lap 68 that ended her day, relegating her to a 35th-place finish. But the upbeat Patrick talked about the race as a learning experience. Her boss, Dale Jr., learned the same lessons a long time ago. But it didn’t help him avoid a scary crash on Saturday. His No. 88 Chevy was tapped from behind on lap 91 after Edwards and Brad Keselowski collided . Earnhardt’s car went airborne, hit the wall and rolled. It landed back on its wheel and the battered hulk slid into the infield grass. Earnhardt, who led seven laps and appeared to have one of the fastest cars on the track, walked away without injury and in good enough spirits to joke around. Sunday will also be a big day for Earnhardt, who starts alongside Hendrick Motorsports teammate Mark Martin on the front row. Coming off a miserable, winless year, Earnhardt is looking to regain the magic touch he had for years at Daytona. Stewart, driving a Kevin Harvick Inc., Chevrolet, led 38 laps, one more than Harvick. More important, he led the final four trips around the 2.5-mile oval, holding off Edwards by 0.309-seconds. Now the onetime IndyCar Series champion turns his attention to the biggest race of the season.